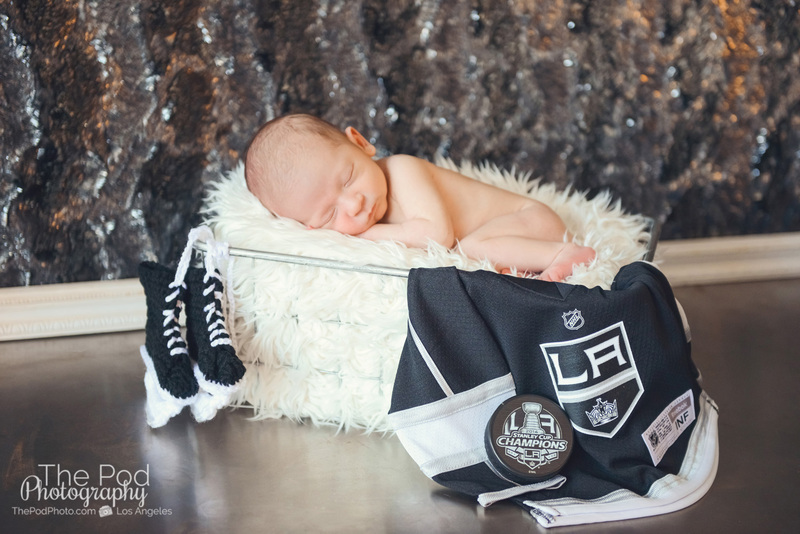 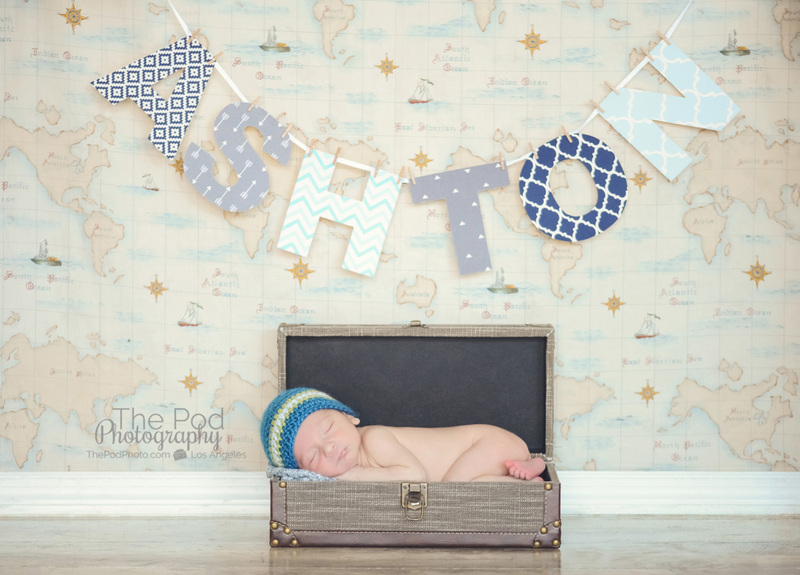 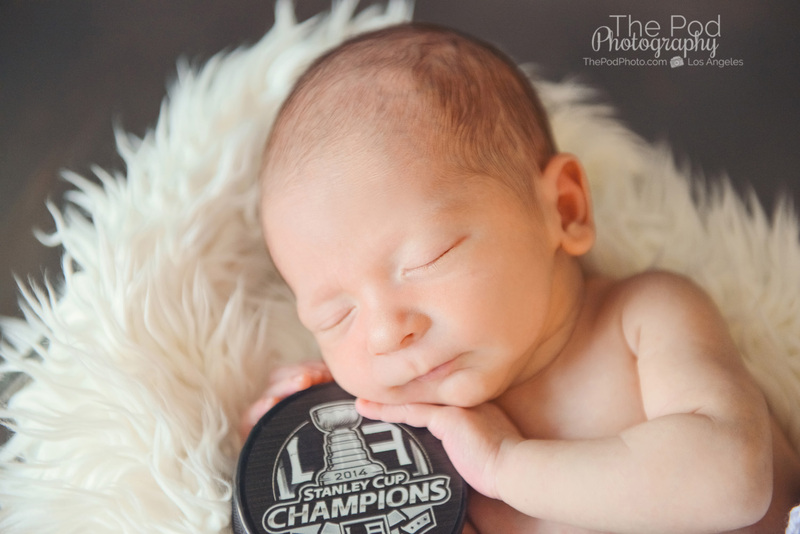 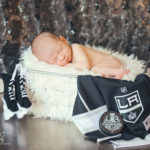 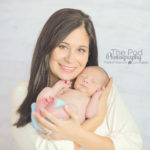 Professional Newborn and Baby Photography Studio Santa Monica - Los Angeles based photo studio, The Pod Photography, specializing in maternity, newborn, baby, first birthday cake smash and family pictures. 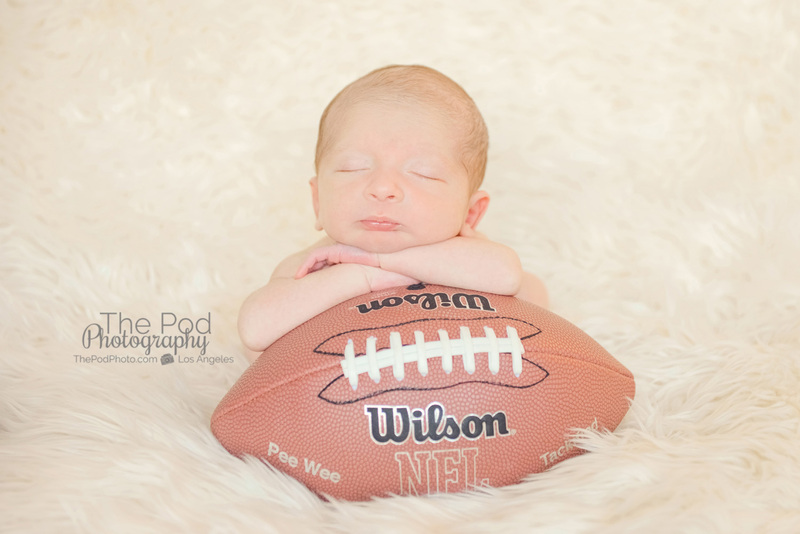 With the Superbowl coming up this weekend – I feel like it’s been football fever around the studio recently! 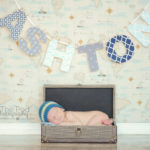 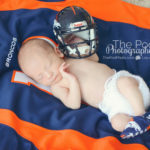 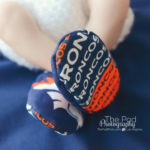 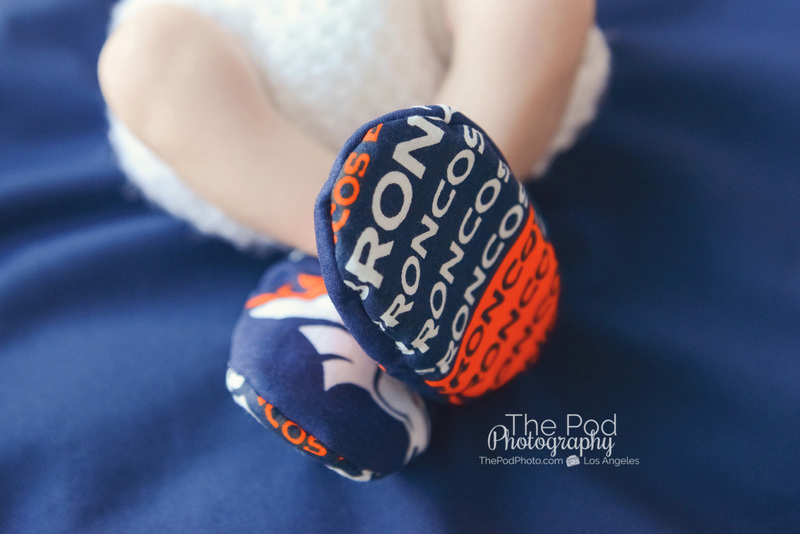 So many of our clients have been requesting a football theme for some of their newborn pictures. 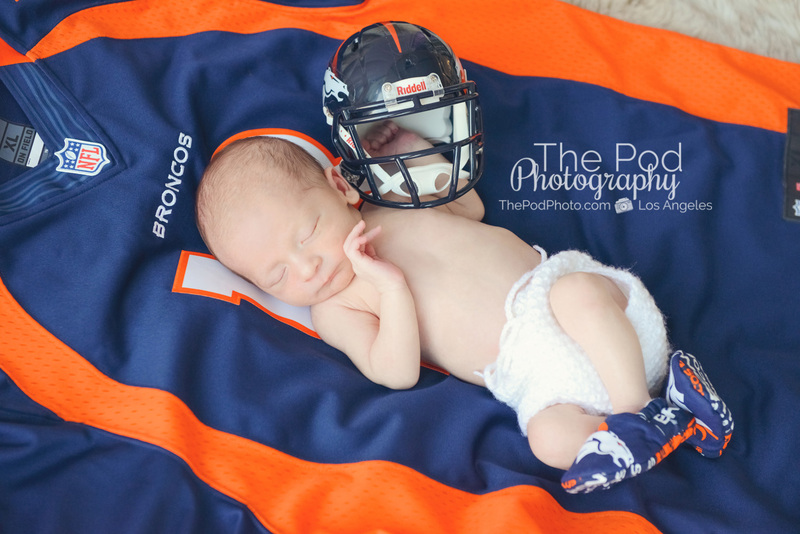 This family loves the Denver Broncos and so dad brought a team jersey in addition to all the fun things we already have at our professional portrait studio. 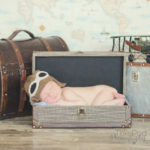 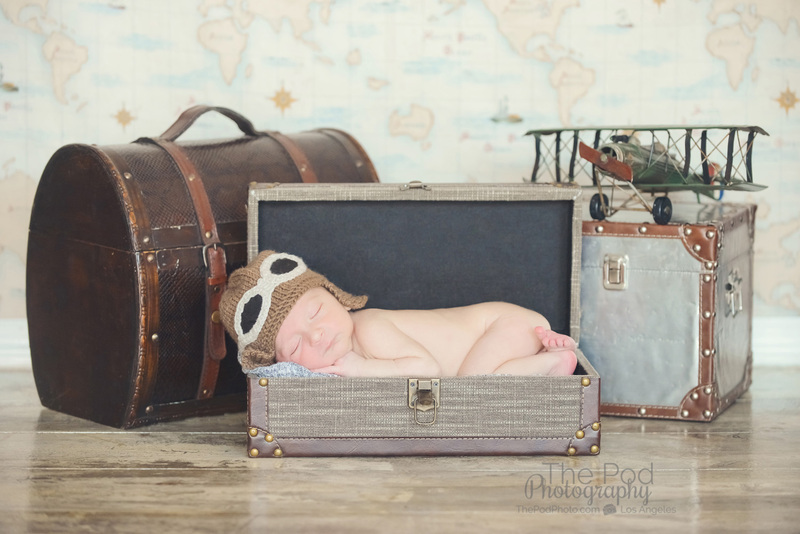 Props are always a fun thing to incorporate into the baby’s photo session, and we have a ton of awesome props and accessories at our studio! 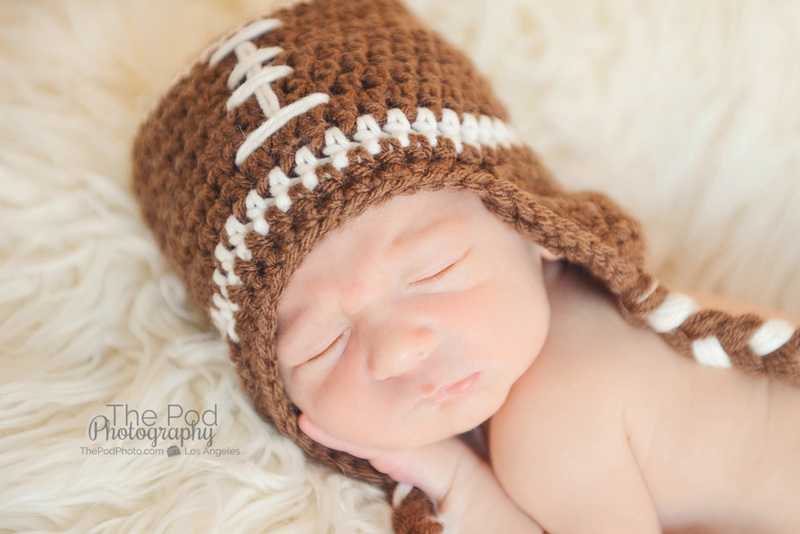 We have the cutest football beanie in a tiny newborn size, and of course a pee wee football for them to snuggle up and sleep on. 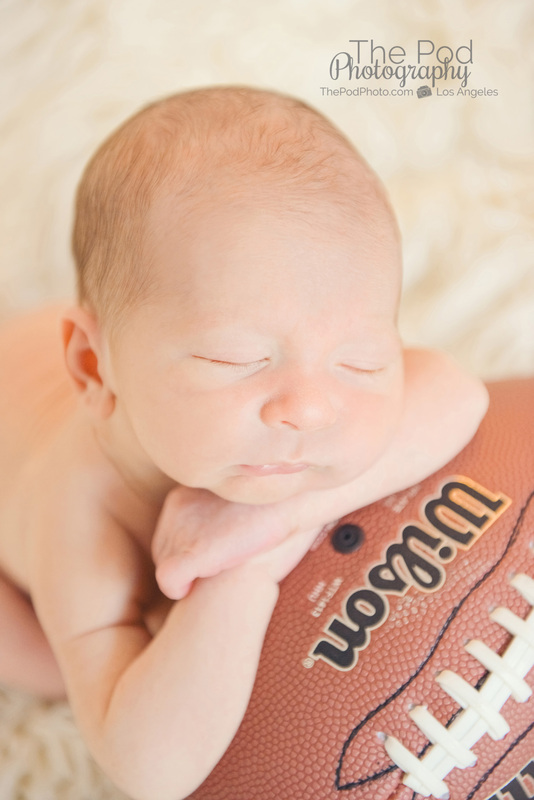 Getting that pose where the baby is asleep on the ball is actually a very tricky pose. 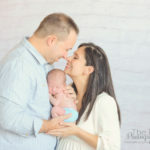 I usually have two people assisting me – one on either side of the baby, to ensure the infant’s safety. 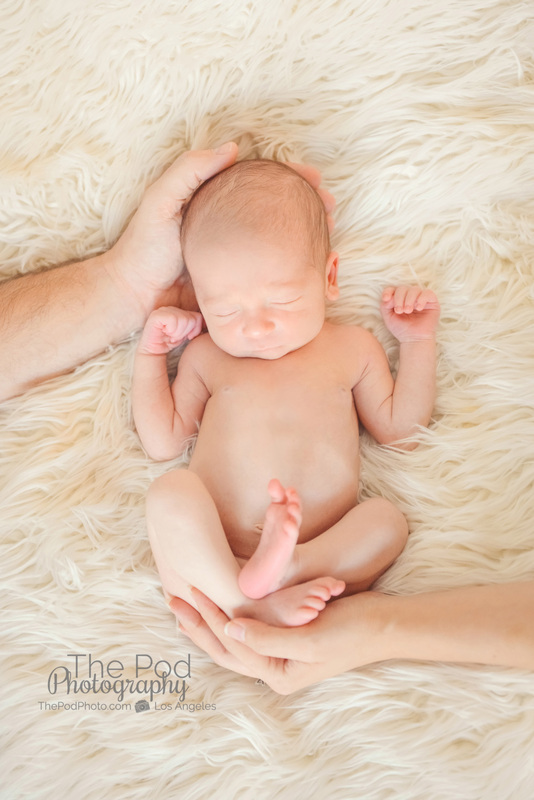 Next we use the fancy heater system – a series of ceiling tracks and hanging heaters that follow the baby wherever the baby is – that we have installed at our Santa Monica studio, to get the baby nice and cozy warm. 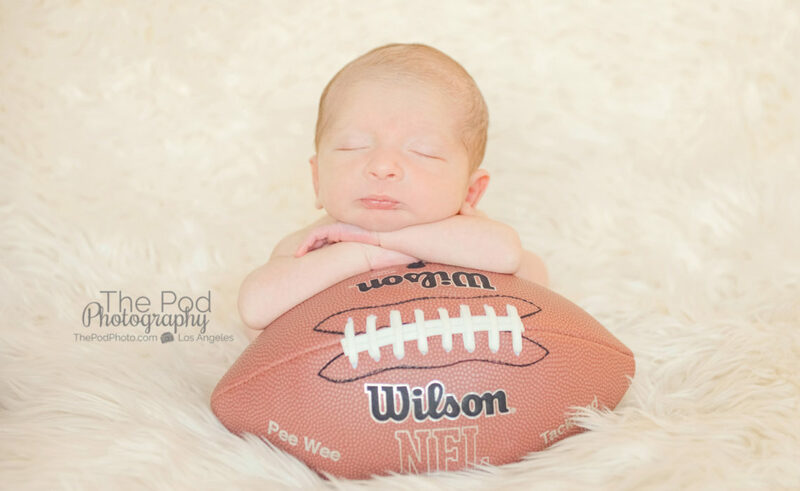 Once the newborn is sleepy enough, we slowly and gently place him on the football with his arms nicely folded in a cute pose. 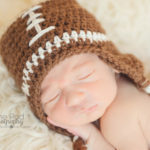 Obviously a hard football is not the most comfortable place to fall asleep, and the babies sometimes resist and fuss. 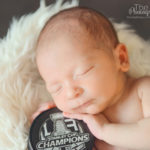 If they are sleepy enough they only fuss for a few seconds an I am able to soothe them back to sleep, but if they wake up and get too mad at me, we have to place them back on the soft fur, soothe them and start the process all over again. 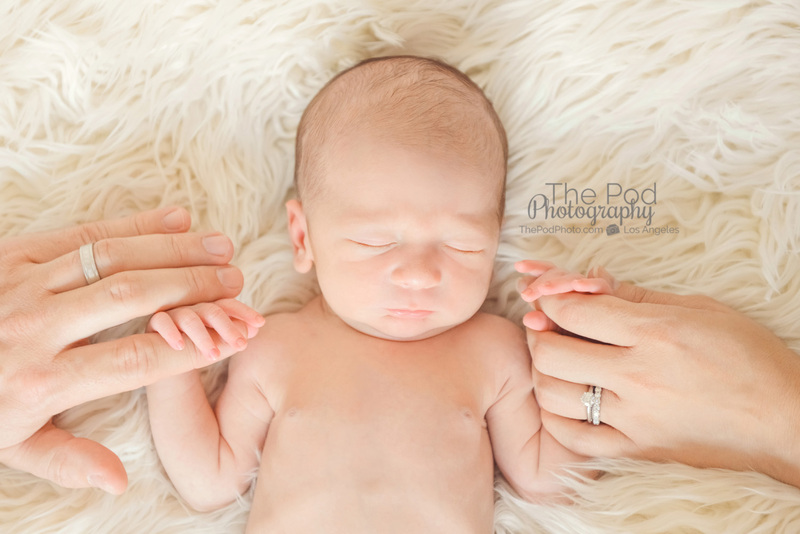 Sometimes I also need to enlist the help of those two assistants to pose the baby, and they will hold him in position underneath the fur so that he looks perfect. 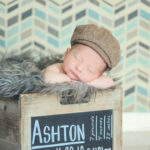 I probably shouldn’t be giving away the tricks of the trade, but these types of poses definitely require a skilled team. 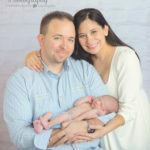 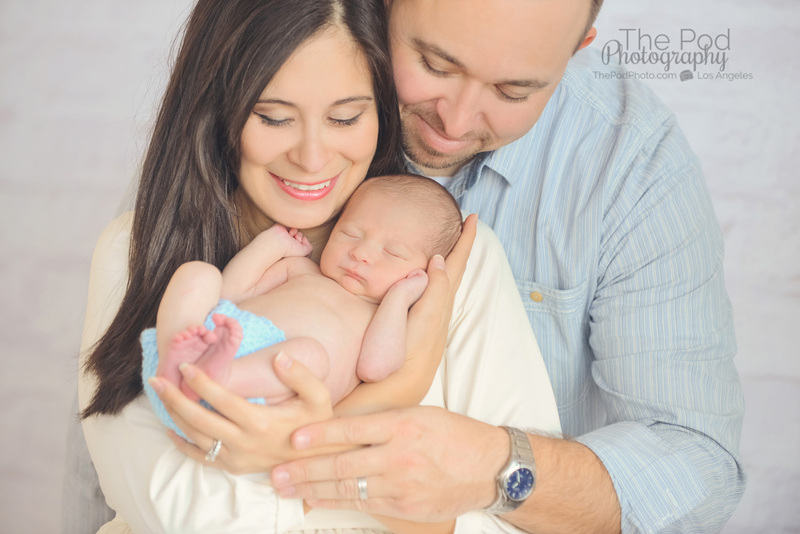 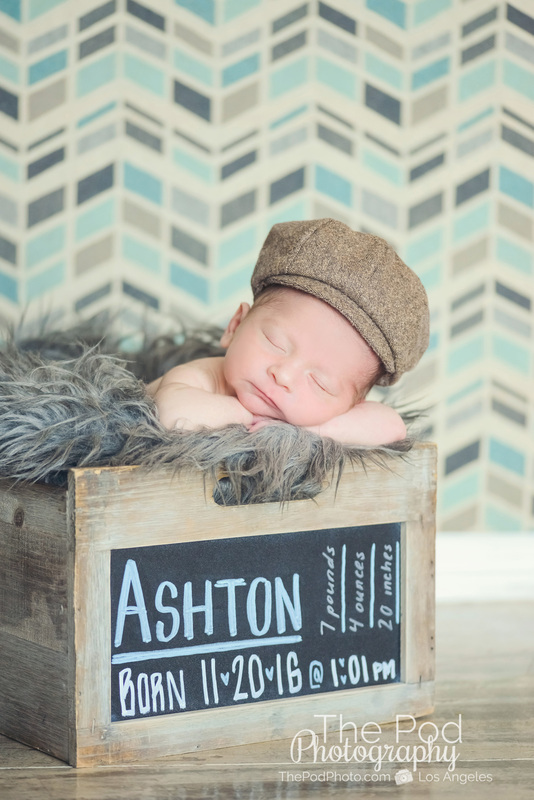 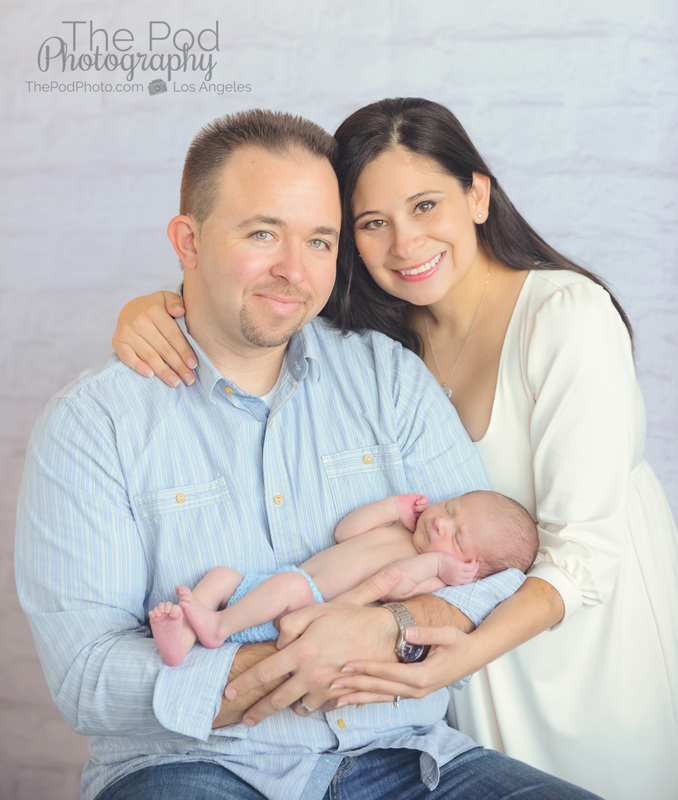 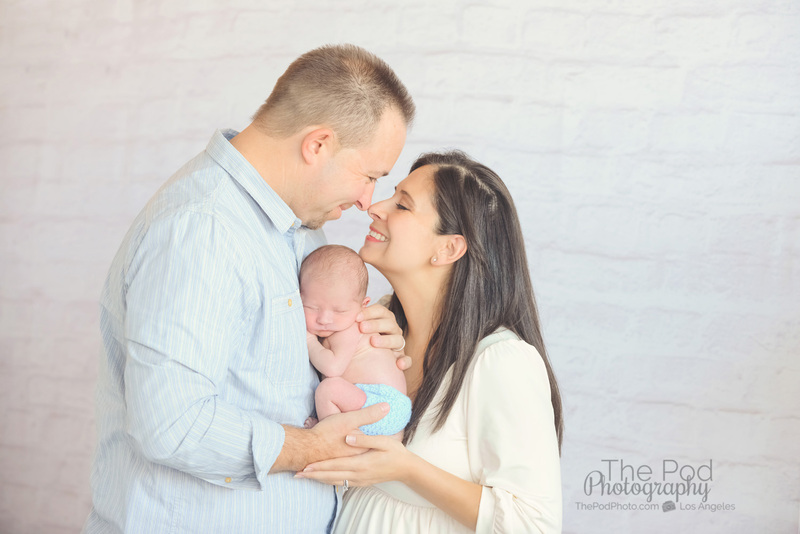 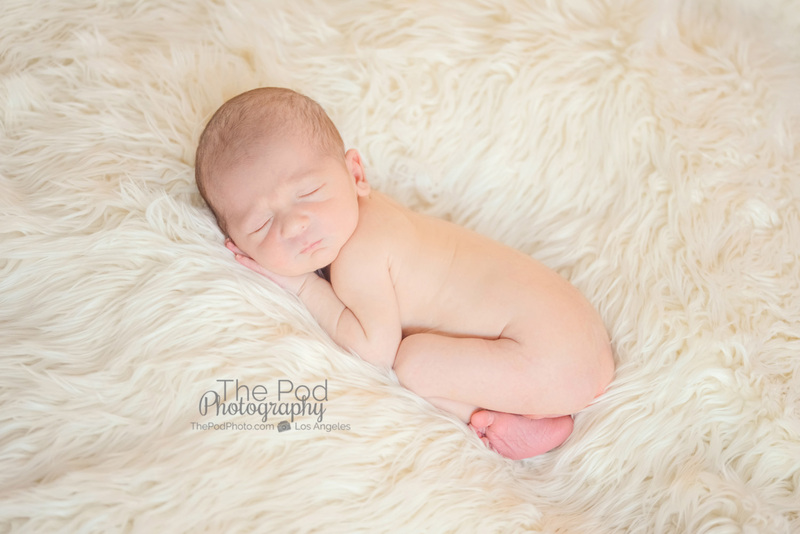 It has taken me almost a decade of being a professional newborn photographer to be able to poses babies in these intricate poses – but the photos are priceless and our clients love them! 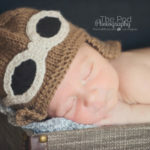 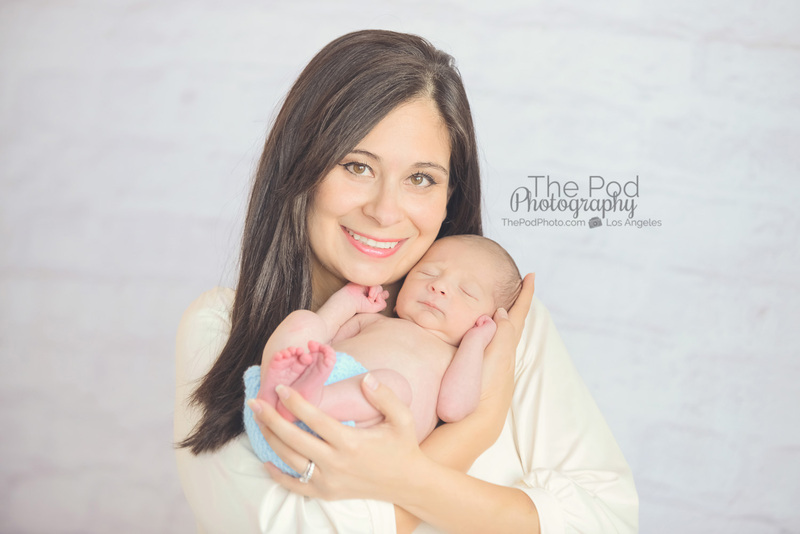 Clients interested in having their newborn baby’s pictures documented with our professional newborn photographers can take a look at our website www.ThePodPhoto.com and give us a call at 310-391-4500. 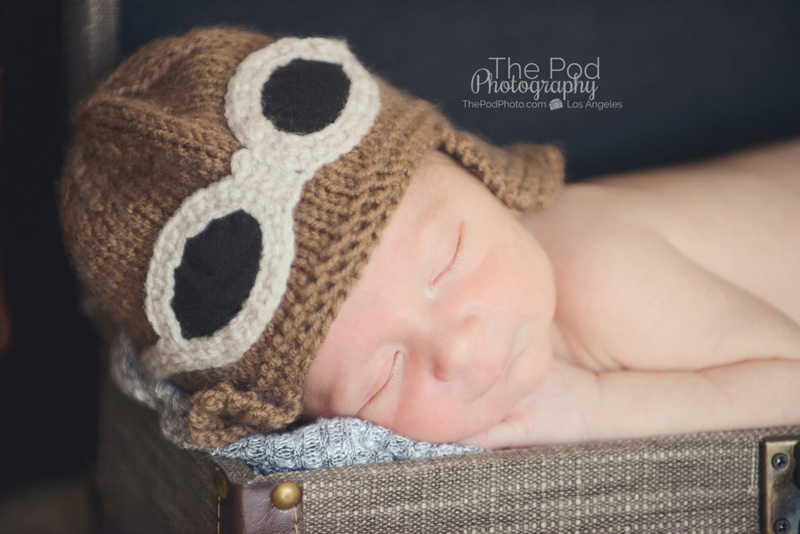 We service the Santa Monica area as well as we can come to your home for an in-home newborn photo shoot. 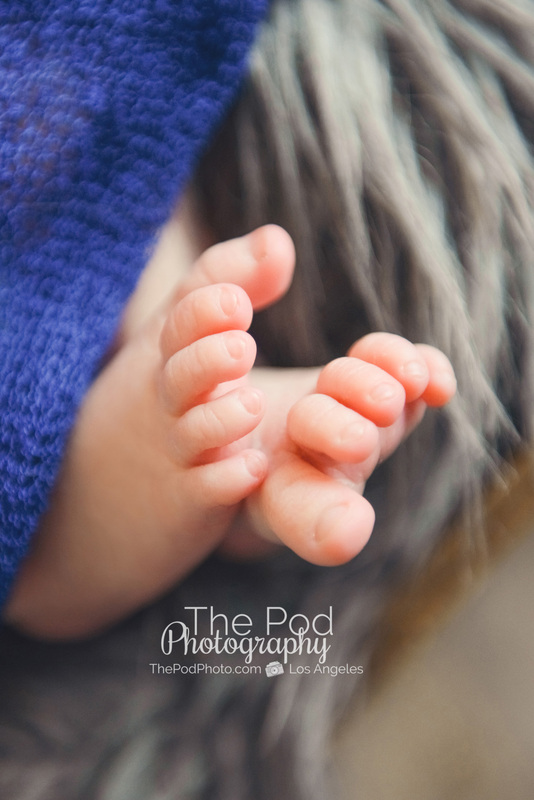 When we document your baby’s pictures in the comfort of your own home, we like to focus on natural poses and a lifestyle documentary feel. 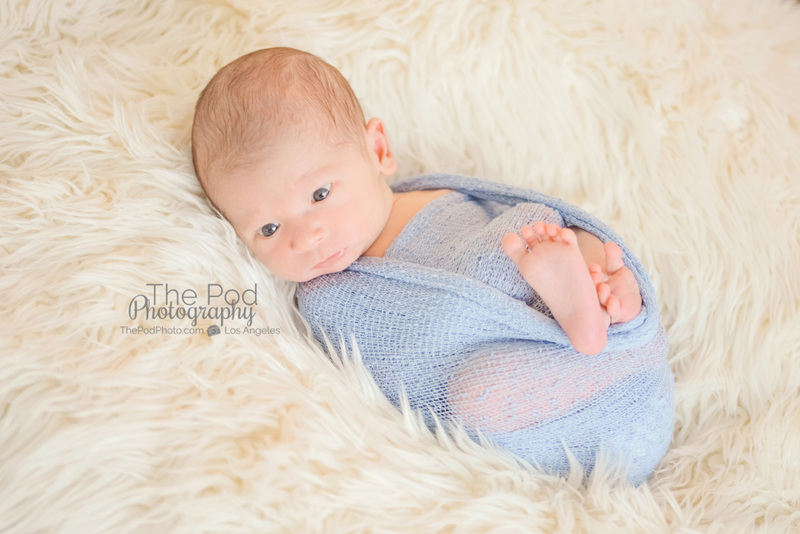 The great thing about photographing your newborn at your home is that the typical ten day time frame is not as important, and we can still capture really amazing photos of your infant when they are a bit older than ten days.